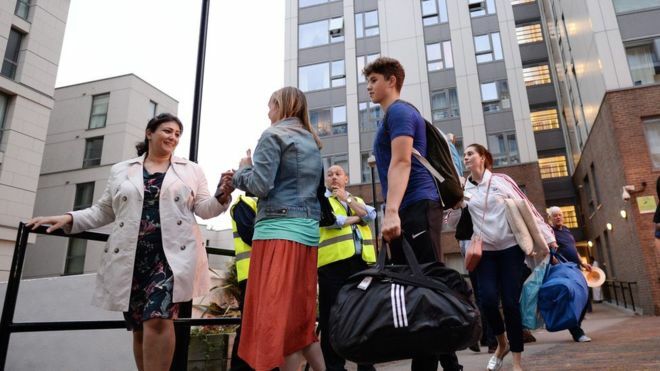 More than 800 homes in tower blocks on a council estate in Camden, north London, are being evacuated because of safety concerns over cladding in the aftermath of the Grenfell Tower fire. 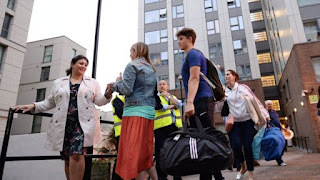 Camden Council says people in flats in five towers on the Chalcots estate will be moved for "urgent fire safety works" - and it is "block-booking hotels". Similar cladding was used on the building to that on the Grenfell Tower. A total of 79 people are feared dead after the fire in north Kensington. Camden Council said it will remove external thermal cladding from five tower blocks on the estate. The council had said it would carry out regular fire safety patrols and safety checks to reassure residents. It had initially announced the evacuation of one tower block, Taplow, but later extended the move to all five tower blocks it had checked. Council leader Georgia Gould said residents of the estate attended a public meeting with council officials on Thursday evening. She said: "Camden Council is absolutely determined to ensure that our residents are safe and we have promised them that we will work with them, continue to act swiftly and be open and transparent." She said London Fire Brigade had completed a joint inspection of the blocks with Camden Council technical experts. It was decided the flats needed to be "temporarily decanted" to allow the work "so that residents can be fully assured of their safety. This means that we need to move residents from their homes and into temporary accommodation". Ms Gould said the work is expected to take three to four weeks. She added: "Grenfell changes everything and I don't believe we can take any risks."